We’re counting down the days until the most slime-tastic and epic event – none other than… the Nickelodeon Kids’ Choice Awards! We seriously can’t contain our excitement for the KCAs as it truly is the best time of the year. But, it looks like Nickelodeon got us all even more thrilled for this spectacular event by announcing some of the many incredible celebs who will be making appearances at the renowned award show. This year’s Nickelodeon Kids’ Choice Awards will have all of our fave stars from the worlds of TV, movies, music and social media together under one roof and we wish the KCAs were tomorrow already. Nickelodeon revealed the star-studded list of celebs who will be joining in on the fun. Ariana Grande will be visiting her Nickelodeon fam yet again at the KCAs and Adam Sandler, Chris Pratt, Jason Sudeikis, Noah Centineo, Lana Condor, Joey King, Liza Koshy, Paris Berelc, Caleb McLaughlin, Kiernan Shipka, Ally Brooke, Josh Peck, Lilly Singh and David Dobrik are just some of the many stars who will be attending the KCAs. In addition, cast-members from Disney’s Aladdin: Will Smith, Mena Massoud and Naomi Scott, Shazam! – Zachary Levi, Asher Angel and Jack Dylan Grazer and Dora and the Lost City of Gold: Isabela Moner and Eugenio Derbez will also be having a blast at the KCAs. Nickelodeon stars including Henry Danger‘s Jace Norman and Riele Downs, Lip Sync Battle Shorties‘ JoJo Siwa, Cousins for Life stars Scarlet Spencer and Dallas Dupree Young, Ryan’s Mystery Playdate‘s Ryan of Ryan ToysReview and Knight Squad cast-members Daniella Perkins, Owen Joyner and Lilimar will all be at the Kids’ Choice Awards as well. As if we weren’t already over the moon with joy, Nickelodeon also spilled that the internationally-acclaimed hip hop trio, Migos will be taking the stage at the event. Migos are set to perform a medley of their hits at this year’s KCAs and will also be joined on stage by Grammy Award-winning record producer and songwriter DJ Mustard. 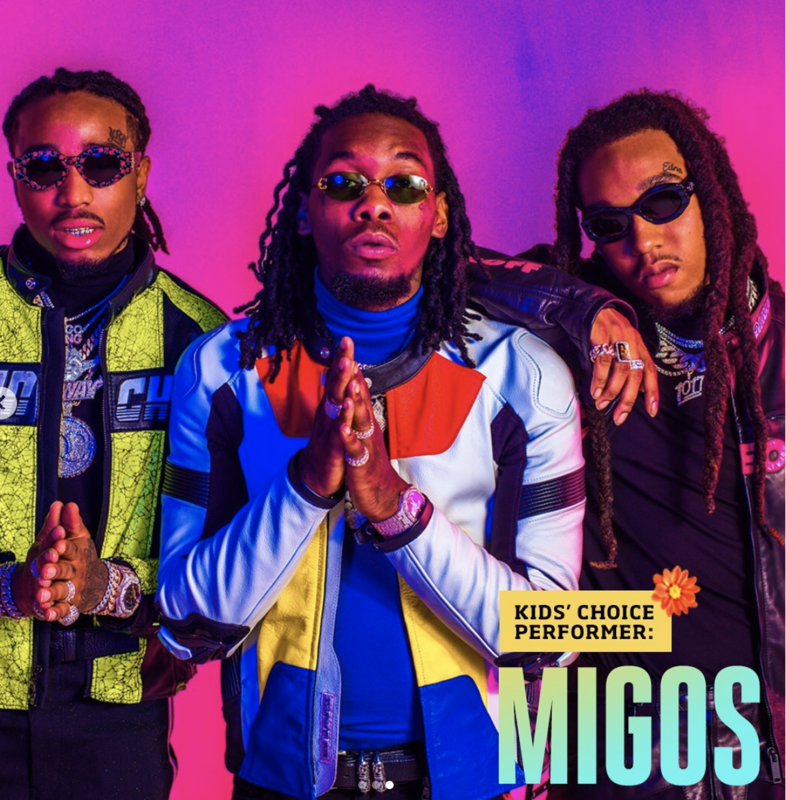 Migos are nominated for a Kids’ Choice Award in the category “Favorite Music Group.” Needless to say, the Kids’ Choice Awards is always one big party that you don’t want to miss, so don’t forget to mark your calendars and tune in to the brilliant award show. Fans can still help their faves win a coveted blimp at the KCAs by voting on KCA2019.com and on the Screens Up app. Fans can also vote on social media networks including Twitter and for the first time ever, Nickelodeon is giving fans the chance to vote on selected Instagram posts. International fans can vote by using the Nick Play app in regions where it is available. The voting fun doesn’t stop there. Fans will also be able to take part in live voting during the show. Get ready for an unforgettable night and be sure to tune in to the 2019 Nickelodeon Kids’ Choice Awards, hosted by DJ Khaled, airing live from the USC Galen Center in Los Angeles, California on Saturday, March 23rd at 8:00 PM ET / PT. Comment below and tell me or tweet me at @alexisjoyvipacc, who are YOU looking forward to seeing the most at this year’s KCAs? Follow Nickelodeon on Twitter and Instagram: @Nickelodeon and visit KCA2019.com for all things Kids’ Choice Awards! Next VIPAccessEXCLUSIVE: Find Out Where Noah Centineo, Lana Condor, JoJo Siwa And More Are Sitting At The 2019 Nickelodeon Kids’ Choice Awards Seating Card Tour With Dallas Dupree Young And Scarlet Spencer!